Week four of Law School is in progress.... I am exhausted, my back hurts from my giant bookbag and yesterday I made a pan of brownies just so I could have some batter. So that's how my life is going. Kidding aside, I am figuring out how to "do" law school and still have a life. 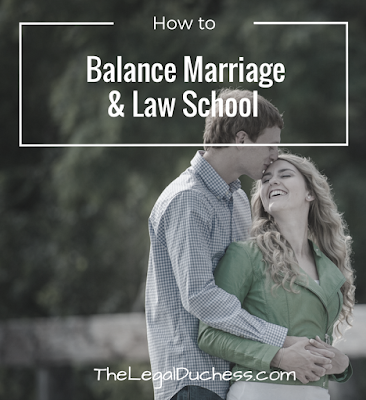 Now that I am a bit more familiar with Law School and all it entails, I thought I would pass along my tips for balancing Law School with a significant other; in my case, my husband of 2 months. 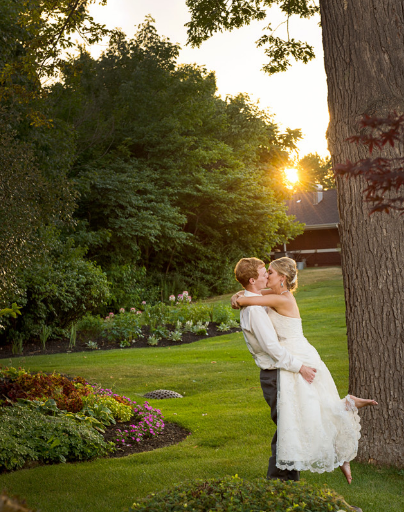 We just received our wedding photos and I am obsessed! My husband was well aware that Law School would take over 85% of my life. He knew that long before it started and we had a lot of conversations about how to balance our relationship on top of the demands of Law School. When Law School started, it was not a surprise for him that I was studying all the time and that dinner wasn't going to be ready when he got home on Tuesdays and Thursdays as those are my long days of class. He has been nothing but supportive and I think starting out with everything on the table and letting a significant other know that life is about to change will help them understand life while you are in Law School. Law School can very easily take over every spare moment if you let it. That will not help a relationship. You have to set aside specific time for your relationship and stick to it. My husband and I made a deal to have dinner together every night to discuss our days, watch at least 1 30 minute episode of something on Netflix while cuddling on the couch, Friday nights we have pizza and watch a movie and we spend a majority of our weekends together, even if that meant I had my book open while he watched football but we were both sitting on the couch. I have plenty of time to study and read for Law School but I also can count on at least an hour of just time with my hubby each night and at the end of a long day of Law School, sometimes that is just the thing I need. On the flip side of my previous point, significant others have a hard time understanding just how big the time commitment of Law School is. There are many times that my hubby tries to convince me to just watch a few more episodes that evening and before I know it, it is 10pm and I still have 60 pages to read. Sometimes you just have to say, "no, I have to study" and get your stuff done. At the end of the day, you are putting a huge time and financial investment into Law School and you need to occasionally make it the priority over 2 more episodes of The Office or a nap on the couch with your man. Same goes for friends and family; often times you have to say no to a dinner with your girlfriends or a family outing because you just have to read and study. It is just a part of the 3 years spent at Law School and the sooner you learn to say no, the sooner everyone will understand. Multitasking is a skill that will save your life in Law School. I have figured out how to prop a casebook up to read while i cook dinner, how to tune out the TV and focus on my reading and how to make time for my husband while getting something else in. For example, we love to take our dog to the local park in the evenings if we have time and weather permits. This not only gives me some exercise and time away from books but also I get quality time with my puppies and my hubby. One activity = 3 things accomplished! Sometimes you just have to figure out ways to make the most of your spare time because it is so limited. Though your significant other probably does not want to know the full brief of each case you read, letting them in on what you are doing, reading and learning can help them to be more supportive. My first week of Law School i tried to keep everything to myself and only tell my husband overall statements about Law School because I did not want to burden him with my struggles and I didn't think he wanted to hear about cases and if I got cold called in class. The Saturday after my first week, I had a meltdown when he complained about how distant I was that week; I explained to him how I was trying to keep things to myself to not burden him and how much I was struggling and how hard Law School really was. We figured out that talking about it more would be better and he also surprised me with tickets to see Wicked the following weekend to cheer me up (I have the BEST hubby). Needless to say, things have gotten much better since then: he makes a point to ask about my classes and I now know that he does want to hear about things, good and bad. Being able to come home and talk about my day is a great outlet; bottling things up and keeping it to yourself will drive you nuts and them nuts. He thought I was pushing him away and that frustrated him because he wanted to know what was going on and support me while I thought I was doing the right thing by not bugging him with my Law School problems. Being open about Law School helps them to feel involved and to understand it more and in my experience, they will be more supportive. Law School is all consuming and you have to make a conscious effort to keep your relationship strong. However, it is worth it to have the support and love to fall back on when the going gets tough. Law School is a phase in your life while, in my case, marriage is for forever. It is not worth risking your relationship for a few extra hours of studying- make your relationship a priority and hold on tight... 3 years is not that long and with a little bit of work, you can make it through with a Law degree and a healthy relationship. Thank you for this post! Even though I am not married, I do have a boyfriend who wants quality time (which I do too of course). I just started law school 2 weeks ago and I'm already so stressed out, especially about constitutional law, I can't work out the concepts, etc. And I feel like I can't talk with anyone that's close to me about it, because they have their own stuff to do and their legal knowledge isn't much either. But because of this post, I'm gonna try and talk more about my struggles and try to be more efficient with my time and make some deals about spending quality time with boyfriend.. Stick it out! You will find a balance that works for you and your boyfriend. It takes time- I am in my 4th week of Law School. The first 2 were rough! thank you so much for this post. my husband just started his second year of part time law school (we've only been married for a few months) and i have been scouring the internet looking for articles and blogs about balancing a marriage during law school. it's encouraging to know that we aren't alone in this stressful stage of life! thanks for the tips! Hi Bethany!! I am so glad my blog provided some insight for you. It is not easy for either partner; Law School affects both people and is trying for the relationship. Just keep your relationship a priority and try to be understanding for what he is going through. Let me know if you have any other questions! This post is so great (and your entire blog)! I start law school this August and will get married in December and this has been one of my worries. So glad there are simple ways to make it work!